Gameboy Diagnostics is a relatively simple program for the Nintendo Gameboy, Gameboy Color, and Gameboy Pocket. It is a program that the user can use to test all of the features on the Gameboy. 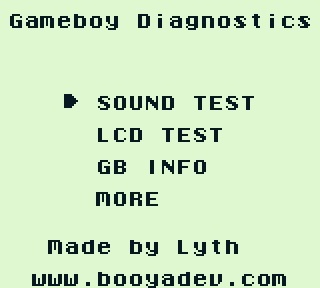 Features include: LCD scanline test, Button Input test, Sound (Mono & Stereo) Test, Color Palette Test (for GBC), GB Version Info (displays system info), and many more.